The 11th seeded VCU Rams and 8th seeded Butler Bulldogs seems to be the game to watch on Saturday. In a recent post I discussed why I think the Uconn/UK game should be the game to watch. However, I do not want to discredit or downplay this match up. I think it’s going to be a very exciting game especially if VCU can keep up the way they have been playing these past few weeks. I also think Butler is very well coached and very disciplined. Here are my thoughts on the game. I’ll come out and say it now. Butler wins. This is why. VCU has admitted that they have nothing to lose so they’re going to run around and press the whole time and take quick shots if they want to. That my friends is undisciplined basketball. Yeah maybe it worked for them to get to this point but lets look at who they have played since the field of 64. Georgetown, not the most disciplined team. The press got to them. Purdue, played like crap and VCU was on fire. Good win for them. FSU. Not the most prolific scoring team to begin with. FSU is known for their defense. VCU made 1 more shot than FSU to win that game. Then came Kansas, whose infamously known for being upset in the tournament. Another good win for them. And now they face Butler. 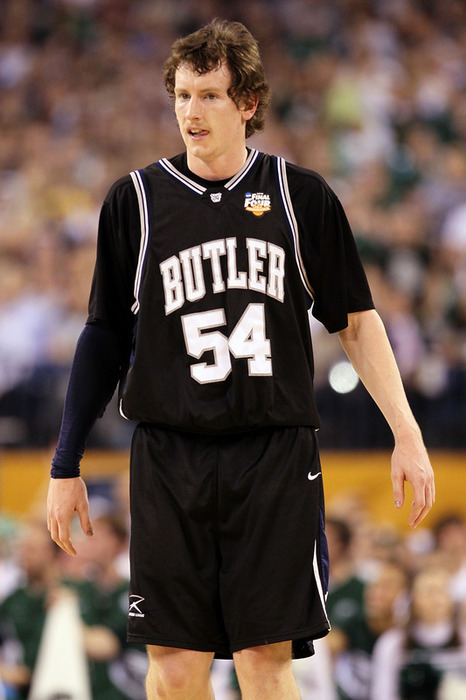 Butler will undoubtedly be the most disciplined team they have faced thus far in the tournament. 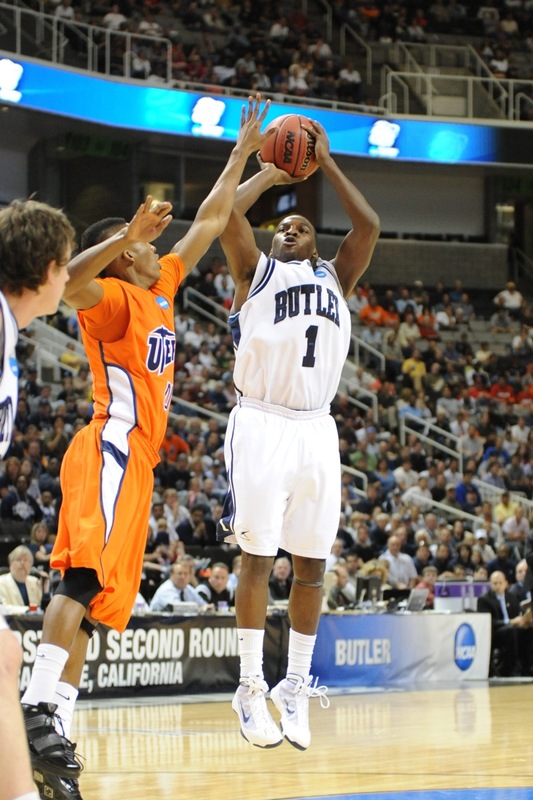 Butler moves the ball with a goal in mind every time down the floor, to get GREAT shots. They know in order for them to win they need to play as a team and to play disciplined. They do that on both ends of the floor. Butler also plays very good solid man-to-man defense. As of late VCU as been lighting it up from all areas on the floor, except when Kansas locked them up and pressured the ball during the second half of the Elite 8 game. I feel that if Butler can keep good ball pressure, which they will do because Brad Stevens is a smart coach, VCU will not hit as many shots as they have. Though Shaka Smart is a great coach I think Brad Stevens is better. I think this game will come down to two things. 1) being disciplined and 2) coaching. I think Butler wins both of those categories and will see themselves in their second straight National Championship game. Setting up a match up with the Uconn Huskies! There’s a lot of excitement and anticipation building up for this weekends games. Everyone wants to see the game between VCU and Butler and most forget that Uconn and Kentucky are still even in the tournament. Unfortunately Jim Calhoun and his Huskies are being put in the shadow this weekend. His star Kemba Walker has earned himself as much attention as his heart could ever desire with the way he has played this season. 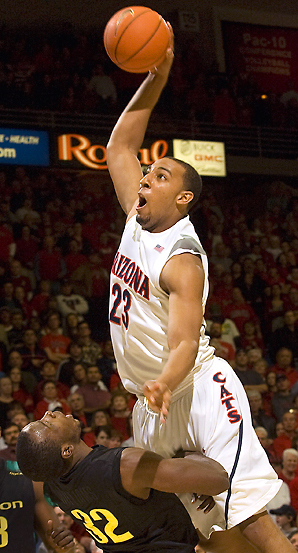 His last second heroics have made him a finalist for the Naismith Award (National Player of the Year). Fortunately for John Calipari him and his team are also in the shadow because of the other Final Four game. I find it strange that Calipari’s last two Final Four appearances have been wiped from the record books for NCAA violations. Could this be his third strike? Only time will tell and I wouldn’t be surprised if it was. Regardless of whether or not each team deserves to be in this game because of codes of ethics or what not it’s sad to say that most viewers (besides Uconn and UK faithful) of the Final Four this weekend are only watching simply to see who will play the winner of the VCU/Butler game, which coincidentally is played before the Uconn/UK game. I have a few thoughts on this game though. I’m actually looking forward to what the experts are calling the “Goliath” match up. Not to take away from Butler or VCU but I think this will be a better basketball game. I could be wrong though, as I have been many times in my life. But, I think watching a combined seed total of 7 (UK=4, Uconn=3) will be much more enjoyable than watching the 11 seed VCU face up against the 8 seed Butler. Colin Cowherd of sportsnation put it like this, and on this rare occasion I agree with him, “Everybody says they love the Cinderella story but, the day after the game ratings are terrible”. 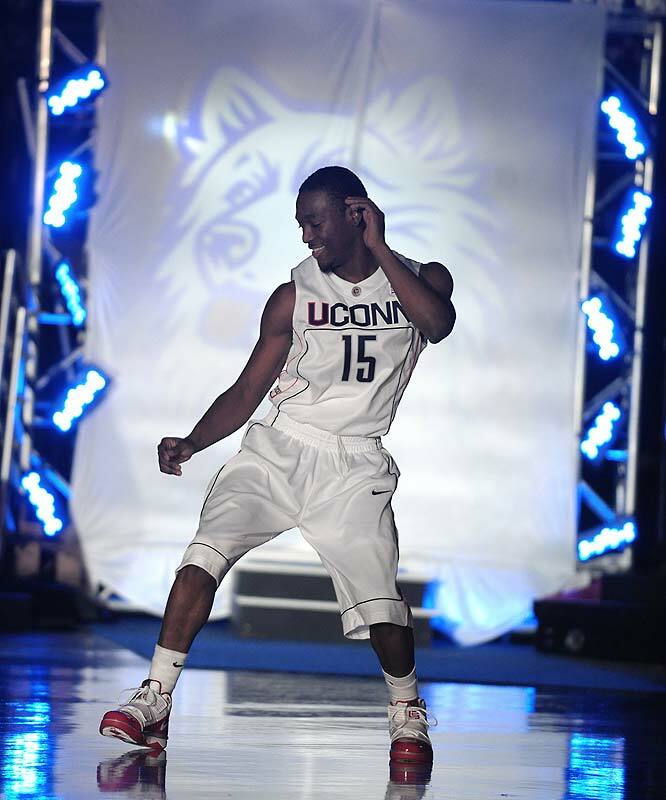 As for the Uconn and Kentucky game, I think it’s going to be awesome. I thought Kentucky was going to be beat easily against Ohio State and their bigs played one hell of a game. Though VCU has been surprising I’m just as surprised by Kentucky. I didn’t think the SEC this year was worth a darn but here are the Wildcats ready to battle the Huskies. Even though Calipari figuratively has two Final Four appearances Jim Calhoun has much more tournament experience. 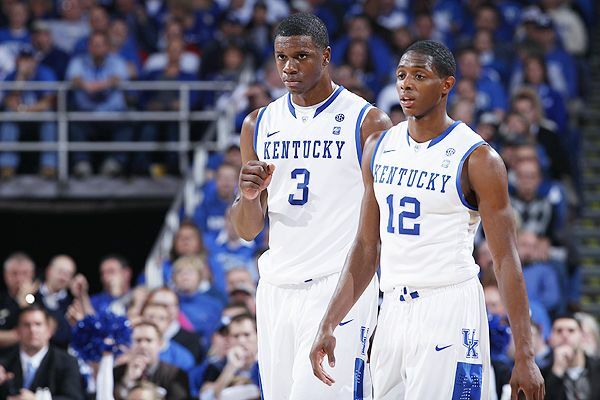 I think Calhoun’s experience mixed with Kemba’s dominance aided by freshman Jeremy Lamb will be unstoppable. Uconn is currently on a 9 game winning streak. What’s more surprising than that is all these wins have come during the Big East tourney and the NCAA tourney. Against quality teams. The NCAA tournament isn’t necessarily about whose the best team in the nation. It’s about whose the hottest team in the nation and right now I think it’s no doubt that Uconn is the hottest team (though some would argue VCU is). I see the Huskies continuing their winning streak and making it to the National Championship game. Painter met with Missouri Athletic Director Mike Alden today in Orlando, Florida where he was on vacation. Painter did not leave on the private flight back to Missouri with Alden. Also, no decisions have been made by Painter and his future. It is known that Painter left Orlando shortly for West Lafayette. This could be bad news for Boiler Nation. Painter not leaving for Missouri could mean a few things. 1) He wants to talk to his players about him leaving. Most coaches do not just up and leave without talking to their players. No matter how hard it is to tell them you’re leaving. 2) It’s also known that Matt is meeting with Purdue officials. However, he is not meeting with Purdue AD Morgan Burke. To me this means he’s not willing to talk more offers and has most likely already made his decision. 3) Painter has to get his things and move his family. It seems hard to believe that he would leave but according to sources close to the Kansas City Star the odds favor Painter taking the Missouri job. 4) All this talk means nothing and Painter wants to get back to work in West Lafayette and get more money out of Purdue. My feelings are that Painter is leaving. There’s no reason why he should be taking this long to make a decision. Even if he is just trying to get money from Purdue. He’s coaching at his alma mater and is comfortable with where he is at this point at Purdue. Once Purdue put more money on the table he should have accepted it if he was going to stay. The simple delay in his decision makes me wonder about his loyalty to the Purdue program. I’m not really worried about losing Painter. There’s a ton of new young coaches that are looking for big time jobs. I’ve mentioned a few already but I’ll reiterate a few I wouldn’t mind seeing at Purdue if a coaching change is needed. Shaka Smart (VCU), Brad Stevens (Butler, most likely wouldn’t leave), Steve Lavin (St. John’s), Greg Lansing (Indiana State), and there are a bunch of others that could be a good fit for Purdue. The coaching situation is the least of my worries for Purdue right now. What really worries me is what’s going to happen if Painter does leave with Robbie Hummel. I personally haven’t heard any rumors of Hummel leaving and I don’t think he will. But, it’s hard to argue that crazier things have happened. Robbie has a strong relationship with Matt Painter. He was recruited by Painter and is praised by Painter. It’s no doubt that Robbie loves Purdue, you could see that when VCU routed Purdue in the round of 32. Hummel was seen on the sidelines with tears in his eyes while watching Purdue get bent over. It was hard to watch a kid my age balling his eyes out on the sidelines while his two senior buddies were able to play. 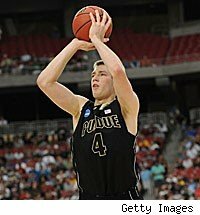 Matt Painter and Purdue not only let down their fan base but also Robbie Hummel. A kid that has totally committed himself to something greater than he, at this point Robbie Hummel > Purdue basketball program (in my opinion). The kid works harder than any other player and is probably the most athletically gifted and intelligent. He’s basketball smart and can make extraordinary plays. It worries me that Robbie might leave if Painter does. Where he’ll end up? I have no idea. Maybe he’ll declare for the NBA draft or leave for Missouri too. Everyone knows that Hummel can still play and it’s not hidden that his teammates this year really needed him on the court. As for Purdue’s program. If Painter leaves and Hummel stays I think they’ll be fine. If both leave they may be in trouble for a few years. Coaching changes always hurt recruiting and transfers usually follow as well. However, with the leadership ability of Lewis Jackson and Robbie Hummel I think Purdue will remain at the top of the Big Ten. Only time will tell what is going to happen to Purdue but in the long run (next season and years to come) I think Purdue basketball will be just fine. Hopefully this fall Purdue football can give us something to think and talk about until basketball season starts once more. Coach Matt Painter is 137-63 in his 6 seasons at Purdue, which may be over shortly. ****It’s been reported by espn.com that Painter met with Missouri AD Mike Alden and other Missouri officials who flew to Orlando to meet with Painter who is currently on vacation. Both parties left in different cars according to a source close to the Kansas City Star. The source also stated, “The ball is in his court, Purdue has come up with more money. They don’t want to lose him”. Matt Painter will take at least 1 more day to make a decision. Once again coaching changes and signings are making headlines and their own March Madness. Something that really hits close to home is Matt Painter and his future with Purdue. 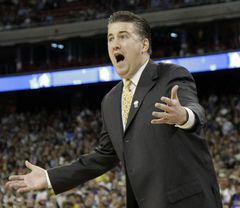 According to stltoday.com Matt Painter has agreed to meet with the Missouri Tigers. Painter has agreed to meet to discuss the seriousness and commitment level of Missouri’s Athletic Department support towards the mens basketball program. The Tigers are in search of a new coach after Mike Anderson left early last week to take the vacancy at Arkansas. Missouri offered Anderson a contract extension of 7 years and about $2 million a year. Currently Painter makes $1.3 million, which makes Missouri appealing or even leverage for Painter to get Purdue to give him more money. Reported by stltoday.com a decision will be made by Wednesday (March 30, 2011) and apparently it’s better than a 50% chance that Painter will take the offer. Personally I’m not too concerned with a 50% chance. Maybe that’s just my youth and inexperience with how contract offers work. But, according to a close source with Purdue’s Athletic Department, Purdue’s AD Morgan Burke has met with Indiana State’s head coach Greg Lansing. This news worries me. This means that the possibility of Matt Painter leaving has increased. Why else would Purdue start looking for a new coach? If Matt Painter does leave I say we wait until the NCAA tournament ends. That way, we could send a very inviting proposal to Shaka Smart, VCU’s head coach who recently beat Purdue by 18 during the first weekend of the tournament. That would be my pick to take over for Painter. Just a thought though. Heck, I would even try and go after Brad Stevens of Butler. Even though he says he will not leave Butler, you have to take a shot. I also wouldn’t mind Steve Lavin at all. And I have to ask now that I know how to add polls. Who would you like or think should take over Purdue’s head coaching job if Painter does leave? I’ve decided to fool around and try to enhance my page even further by seeing just what I can do with this site. So, without further adieu here’s my first poll. Enjoy! 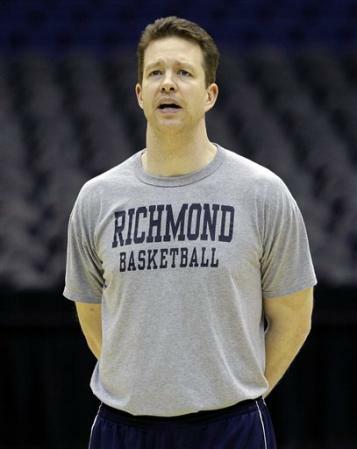 Richmond University and their coach Chris Mooney settled on a contract extension through the 2020-2021 season. This 10 year extension is the 3rd straight season Mooney has been offered an extension at Richmond. Sources say Richmond wanted to get a deal done quickly in anticipation of Mooney being given offers from power conference schools. Richmond had the right to be worried about this. The numbers speak for themselves. Last year Coach Mooney led the Spiders to a school record 26 win season. That win total was surpassed by their 29 victories and trip to the Sweet 16 where they were defeated by the Kansas Jayhawks 77-57. Both Mooney and Richmond are excited about where the program is headed and are happy with the deal that’s been made. Amidst all the chaos happening during the rest of the tournament coaching changes also are college basketball fans attention grabbers. Tennessee signed Missouri State’s coach Cuonzo Martin earlier today and now Richmond makes a move to solidify who they believe is the best fit for them for their Men’s College Basketball Head Coaching position. With the way this past season has played out with Both Butler and VCU as mid-major teams making the Final Four this signing could be a major step for other non-power conferences. Maybe the little guys won’t be so little in years to come which will be something for College Basketball fans everywhere to look out for! This tournament has been nothing short of ridiculous. I’m not very old but I don’t remember ever seeing so many upsets not only during the tournament but during the regular season. Which makes me wonder. It’s the game of college basketball becoming watered down or are the players becoming that much better? Making the game much more competitive? I’ll go with the latter. Personally, I’m not a fan of this year’s tournament. I also think it’s fair to say that Ohio State was the most consistent and dominant team and was eliminated in the Sweet 16. Pittsburgh could also be argued to be the best team in the nation winning the Big East outright which was considered the best conference this season in basketball. These two teams are no longer in the field of 5 (Kentucky and UNC are currently playing for the 4th spot in Houston). I’m all about upsets but not this many. Seriously who wanted to watch Richmond vs. Morehead State? Or even 11 seed VCU vs. 10 seed Florida State in the Sweet 16? I’m all for Cinderella teams but not 4 Cinderella teams. Another thing that has made this tournament less enjoyable is the pathetic excuse of refereeing. I know it’s a tough job but let’s get real here. These are supposed to be professionals. I’ve seen so many missed or bad calls this tournament to make up a lifetime. I know that if I make that many mistakes I’m fired and no longer have a job. I like to watch good basketball and solid refereeing is a huge part of a good basketball game. Crappy refereeing = crappy/sloppy basketball from one team making the games usually lopsided. Overall, the calling of these games has been less than acceptable. After the second round (field of 64) I knew not to be surprised by who won and who lost. Yeah all these upsets are good for ratings and possibly for the game but, I’m having a hard time accepting that the way the tournament has played out. Anyway, Congrats to Uconn, Butler, and VCU for making it to the Final Four and congrats to whoever wins between Kentucky and North Carolina. Kansas has been one of my favorite teams since I can remember. They’ve also been more of a heartache and let down than Purdue in past years. Losing to Bucknell, Bradley, and even Northern Iowa in recent tournaments. The always highly seeded and most respected Kansas teams have underachieved. Not this year folks. At this point in the tournament you can say that every team deserves to be here. Honestly I don’t think that’s the case this season. 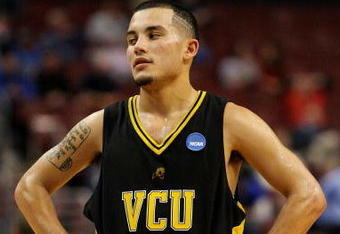 If you’re going to tell me that VCU REALLY deserves to be here then we should talk. VCU got hot the last 5th of the season, Kansas and pretty much every other team played full seasons. Anyway, I would say Richmond deserves to be where they are. There first round game was a classic 12 over 5 seed upset, it happens. Let me get back to my point. I don’t think Kansas will flop this year like in years past. Bill Self has stated the importance of those losses early in the tournament and how that’s made them tough. That’s what helped them come back against Memphis in the ’08 tournament. This year it’s obvious. The Southwest Region is now watered down. The match ups left to get to the Final Four are against Richmond and the winner of the VCU/FSU game (11/10 seeds respectively). I think Kansas is too overpowering in the paint and has too much perimeter support from their guards. The Morris twins are definitely the best big men duos this year. The only comparison from years past that I can remember being this dominant is the Lopez twins from Stanford a few years back. This is how dominant the twins are. They are the top two scorers and rebounders on the Jayhawks squad. I can’t see Richmond being able to defend down low long enough without getting into foul trouble or just being ripped apart. Not only are the twins dominant but they have a good supporting cast. Tyshawn Taylor was a distraction earlier in the year and after serving a suspension has come back hot and contributing and distributing the ball extremely well. If Brady Morningstar and Tyrel Reed can continue knocking down perimeter jump shots they’ll be tough to handle. Let’s not forget Josh Selby either. The kid is a baller and is a smart basketball player and still has a lot of room to grow. Elijah Johnson also stepped up and ran the point in Taylor’s absence and played terrifically. 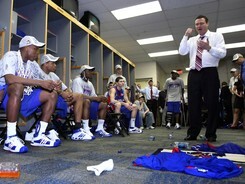 Kansas has the all around squad and the coach to get them to the Final Four. Along with, what I call, watered down competition the road to the Final Four for the Jayhawks should be a done deal. But, that’s why they play the games! I look forward to seeing another great Final Four match up between Kansas and Butler. Too bad it’s next weekend!